P1	P2	P3	P4 What are Natural Resource Charter precepts? Disclosing the contracts that a government signs with extractive companies is an important component of a well-governed extractive sector. Contracts usually contain several provisions that have an impact on the lives of citizens, including fiscal terms that determine what the government will collect in taxes, royalties or production shares; social obligations, including infrastructure, local content and consultation requirements; and stabilization clauses that may partially insulate projects from reforms to the sector (such as increases in tax or royalty rates). When they can freely view these documents, citizens are able monitor whether the government and companies are adhering to the agreed rules. Transparent contracts also provide all stakeholders with basic information that helps allay suspicions about what a deal’s actual provisions, laying the foundation for trusting relationships. Although oil was only discovered in Ghana in 2007, the petroleum sector is already the main source of Ghana’s extractive industry tax revenues. According to the Ghana Extractive Industries Transparency Initiative (GHEITI), crude oil exports in 2015 contributed 4.1 percent of Ghana’s GDP and generated USD 396 million in revenues for the state. With more projects due to start producing soon and plans in place to license more acreage, the sector may become even more important in the coming years. Yet transparency has not kept pace with growth in the sector. After early discoveries, the government published five contracts in 2011—including those for the well-known Jubilee field—on the Ministry of Energy’s website; however, these did not represent all of the deals that the government had made, and amendments or other associated documents were not included in the disclosures. As new deals were struck, no further contracts were added to the published list. In 2016, the Ministry of Energy produced an updated version of the website, but it didn’t include any contracts. Starting in 2008, the Natural Resource Governance Institute (NRGI, then operating as the Revenue Watch Institute), joined a campaign aimed at making contract publication a reality in Ghana. In addition to participating in local advocacy and giving technical advice, NRGI also provided ongoing training and partnership activities that helped civil society advocates and government reformers develop expertise and enthusiasm around the issue. Key advocates for contract transparency in Ghana included civil society groups, but also the oil companies Kosmos Energy and Tullow Oil. Both companies publicly supported contract disclosure, and Kosmos published its contracts as part of the company’s registration statement to the U.S. Securities and Exchange Commission in 2011. These early disclosures demonstrated that contract publication does not prompt negative effects on investment and operations, as many other companies and government officials might have feared. They also showed that pro-disclosure voices were not limited to civil society and could come from the oil producers themselves. These varied groups hoped that the government’s early disclosures were the first steps toward a systematic policy of contract disclosure. However, as time passed this proved not to be the case. Civil society actors therefore continued to press the issue in various forums. Contract transparency was an important part of the public debate that preceded the Petroleum (Exploration and Production) Act (the “E&P Act”), which was signed into law in 2016. In comments on drafts of the law produced as a contribution to the official public consultation process, NRGI advocated for a provision on the publication of contracts. Despite these efforts, the final text only called for the government to “establish and maintain a register of petroleum agreements, licences, permits and authorisations” which should be open to the public. Whether this register would simply include a list of document titles or include actual copies of texts was unclear. In partnership with the Africa Centre for Energy Policy (ACEP), NRGI helped draw attention to this ambiguity and maintain momentum for contract publication immediately after the bill was signed into law. The organization held a public workshop on the E&P Act as part of its 2016 Anglophone Africa Regional Extractive Industries Knowledge Hub summer school. The chairman of the drafting committee for the act was invited and NRGI advocated for an explicit requirement for disclosure of full-text contracts in the petroleum register as part of implementing regulations. NRGI continued this work in 2017, organizing targeted events with partners. 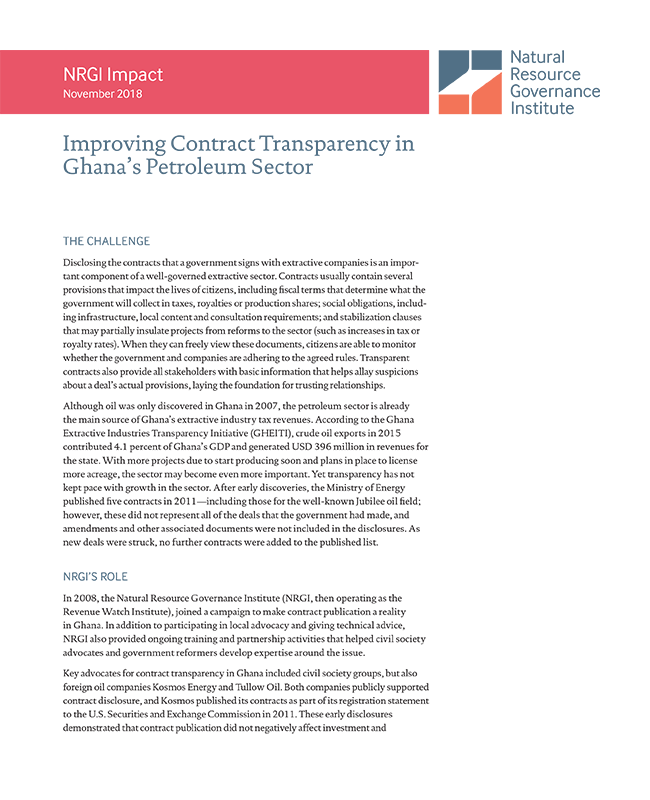 At a roundtable on contract transparency in May, NRGI—along with GHEITI, PIAC and the Ghana Oil and Gas for Inclusive Growth Program (GOGIG)—agreed to submit a set of issues for consideration for the government as officials worked to produce regulations to aid the implementation of the E&P Act. These comments emphasized that it would be important for the government to clarify whether actual contract documents would be included in the register. NRGI also worked with GHEITI to publish a contract transparency briefing in August 2017 that laid out the arguments for disclosure in detail and summarized the documents that should be disclosed. In June 2017, NRGI invited Deputy Minister of Energy Mohammed Amin Adam to give a presentation on open contracting at the African Open Data Conference. At the event, the deputy minister publicly announced that the government would create a public petroleum register that would include full-text copies of all petroleum agreements, licenses, permits and authorizations. NRGI documented and publicized this commitment in a blog post, and along with its partners regularly followed up with the government on progress toward meeting the commitment. The government kept its word, and in early February 2018 published the Ghana Petroleum Register, which featured a comprehensive set of documents for 17 geographical “contract areas.” Following the site launch, NRGI carried out a short analysis of the portal’s usability and sent comments directly to the ministry for minor tweaks and improvements (all of which were incorporated into the register’s design). The register is noteworthy in at least two respects. First, it features a dedicated webpage for each petroleum project, providing important contextual information that helps users understand the projects. Second, it allows the government to add associated documents—including amendments, annexes, authorizations and permits—to the project page. NRGI has used the register as a good practice example in presentations to stakeholders in other countries and as a tool for giving technical advice to governments and companies aiming to publish their own contracts.